Originally Published by Senior Living. In 1780, twin brothers, David and Samuel Hall; fought together in the Battle of Kings Mountain, considered to be the “turning point in the South” of the Revolutionary War. A year later, the Revolutionary War ended and, although confrontations with Indians continued throughout much of the Carolinas and Tennessee, the brothers began thinking about a more peaceful future for themselves. In 1784 David Hall married. Hall served his country well as a soldier and an Indian spy and for it the government awarded him 428 acres in Tennessee. At about the same time, in 1795, Samuel Hall bought 100 acres in the Claxton, TN. area from Aquila Lowe. This marked the beginning of the Hall brothers in this area and the beginning of David Hall’s log cabin that has stood the test of time for over 200 years. The Claxton area was still not considered safe for families as late as 1792 as confrontations with Indians were still being experienced, as was noted in a report from Gen. John Sevier to then governor, William Blount. Clifford Seeber notes in his book, “A Historical Background of Anderson County”, that Sevier’s report proclaimed that the fort at South West Point (present-day Kingston, TN) had been completed. This permitted regular patrolling of Claxton and surrounding areas by Regular Army forces. So. 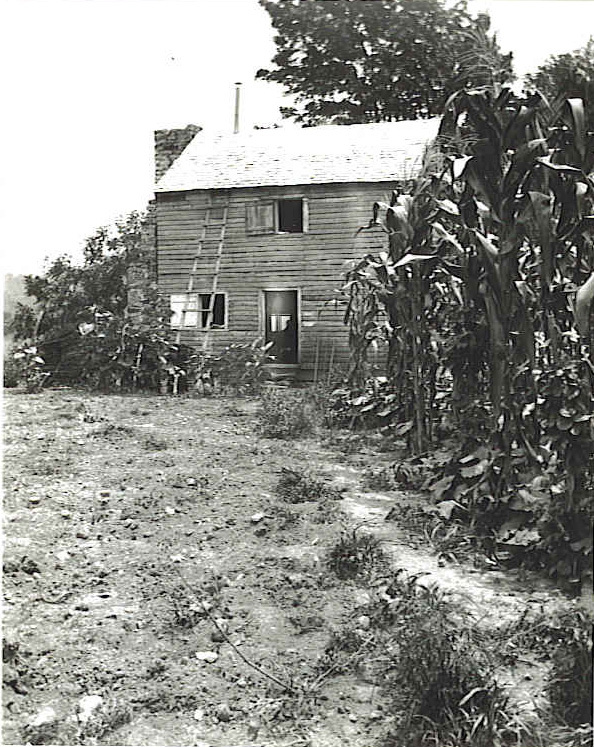 in 1799, in virtually what is now the shadow of the towering, modern chimney of the Bull Run Steam plant, just across the river from Oak Ridge, David Hall built his log cabin home with an inn and tavern next door. And, the amazing thing is: it’s still there! And, if walls could talk, what a tale that cabin’s walls would tell. They might tell about discussions about a petition that David I Hall and 270 fellow area settlers signed to establish a new county, Anderson, out of Knox and Grainger counties. This petition passed in 1801 and the new county was born. Interestingly, the new county wasted little time in creating taxes. In 1802 it established a tax on land of 6 – cents per 100 acres and a tax for “one stud horse” of 25 cents. The county also set rates for ferry operators $1.00 for a wagon and a team, 8 1/3 cents for a man and horse, and 3 cents per head for cattle, hogs, and sheep. Further, rates were set for “public houses”. A “good”, comfortable dinner was 25 cents. comfortable breakfast with “good” coffee was 15 2/3 cents, comfortable lodging was 6 – cents, 24-hour lodging for one’s horse with hay was 25 cents, and a quart of good beer was 6 cents. 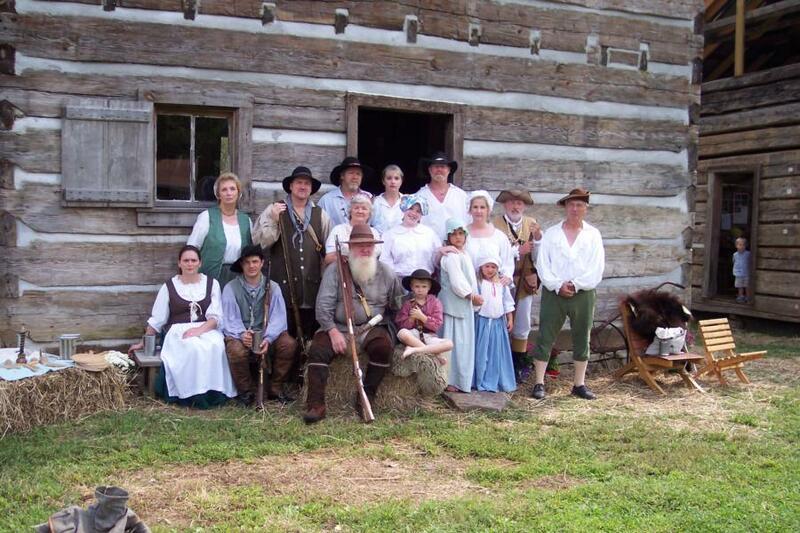 In 1807, Samuel Hall moved on to Morgan County, TN. and is considered one of its first settlers. He died there in 1819. David Hall remained in the Claxton area until he died. During that time he had peach and apple orchards from whence came the makings for the brandy sold as his tavern. He also farmed the vegetables and livestock that he served. And. he and his wife, Obedience, raised 12 kids as well. in 1837 he died and was buried near his cabin. He was 77 years old. David Hall passed, but the cabin continued to stand to serve a role in the Civil War which would be starting up in 1861. Another amazing fact about the cabin is that during its life of over 200 years, it has only been owned by-three families: the Halls, the Arnolds, and the Thomasons. The current owner is Libby Bumgardner, who is the granddaughter of Walter Thomason. And what tales she can tell about the cabin, too. She discovered a trunk-size box of letters, clippings, and notes one day in the rarely visited upstairs of the cabin and is still sorting through them. The box included receipts, letters, bills, IOUs, brochures, Bible verses, and Christmas and Valentine Day cards from the 1800’s. 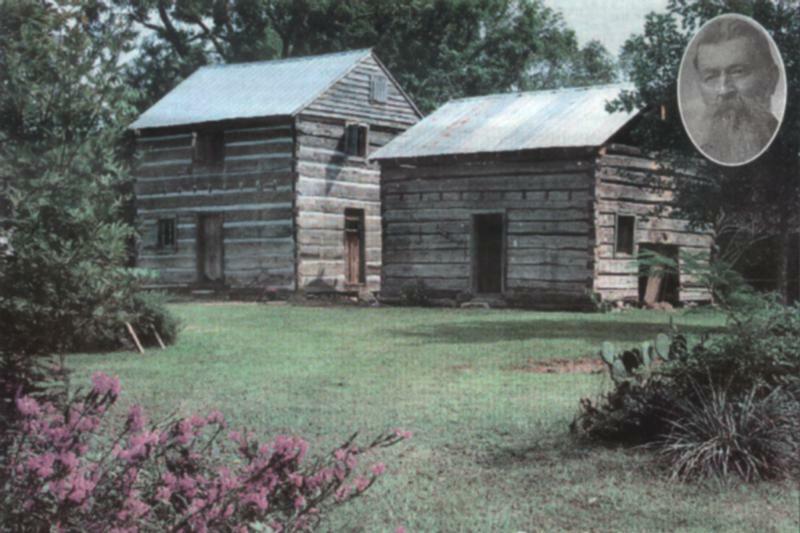 The inn was often visited by Confederate soldiers as they moved through the Claxton area. The rough road by the cabin was actually the main highway that went from Knoxville down to Kingston and on to Nashville. Back then there was a ferry about a mile from the cabin near Bull Run Steam plant. It operated until 1915. One document, dated Aug. 25, 1864, discovered by Ms. Bumgarder, relates to one visit to the inn by a Confederate officer. It is a receipt. The heading is “Confederate States”. The note reads, “I certify the above accounts for use of Gene Roberson’s Brigade”, signed “L.M. Falkner,cs, Roberson’s Brigade” for “two binds of oats”. Another receipt, dated Jan. 23, 1864, reads “I certify my men had eight meals and lodging from Mr. Granville Arnold. … 24 horse feeds and 24 diets”, signed “W.L. Brown.” In May 1865 the Civil War ended. Walter Thomason, Libby Bumgardner’s grandfather, was born in 1868 and the cabin was his home. In 1902, he married Nannie Williams. 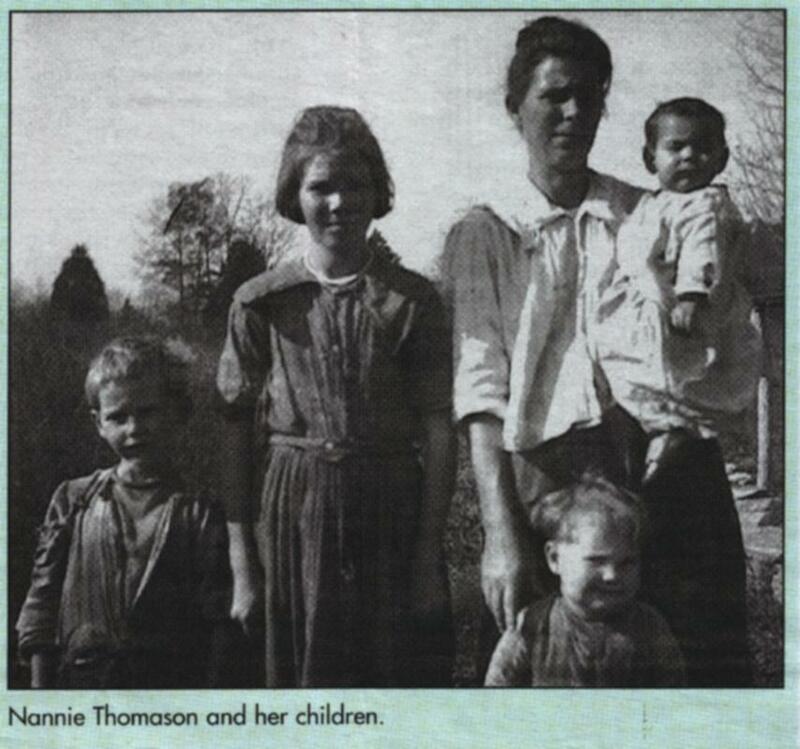 Mr. Thomason worked for the railroad and was gone most of the time – leaving Nannie to fend for herself and children, according to Bumgardner. She produced big gardens and canned the vegetables, grew cotton and made quilts. Some of the quilts are displayed on occasion in the cabin. She raised hogs and made sausage, hauled water from the nearby spring and did the many other tasks usually done by two to keep a family going. Walter Thomason died in 1932. Nannie remarried 3 years later and electricity was installed in the cabin for the first time. Within a few years her new husband died and then Nannie died-in 1954. 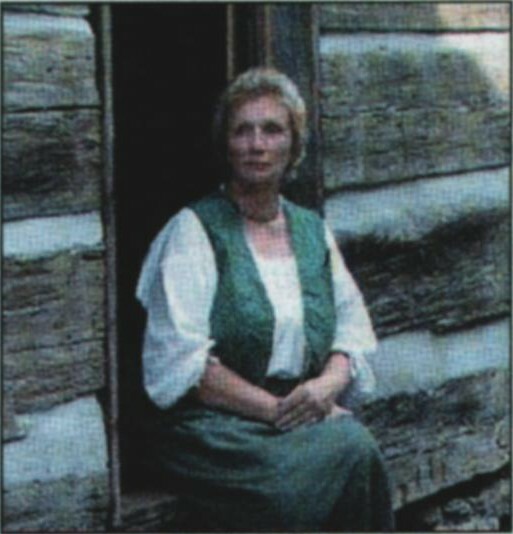 One of Nannie’s daughters, Rova, and 3 of her sons, Rosco, Paul, and Tyson, lived in the cabin until 1976. They were the last inhabitants. Picture taken at the September 11 & 12 2004 “David Hall Day” Celebration. Sitting left to right: Angie Daily, Dave Daily, Hub Chandler, Joshua Chandler. Last row: Chris Chandler, Sheila Chandler, Donnel Brock.